Samsung Galaxy A7 (2018) was recently spotted on the Turkish site Guncelmiyiz with the date for Android 9 Pie upgrade mentioned as March 15. However, the date seen on Guncelmiyiz site could be the tentative release date only for users in the Turkey region. Samsung has, in the past, rolled out updates for its phones in other regions a few days before the dates mentioned in this Turkish website. The phone has now been found on the benchmarking site Geekbench yesterday with the latest OS. This further confirms that the firmware upgrade is on its way to the devices in the hands of the users, though the likely date of launch is by mid-March or a few days ahead. 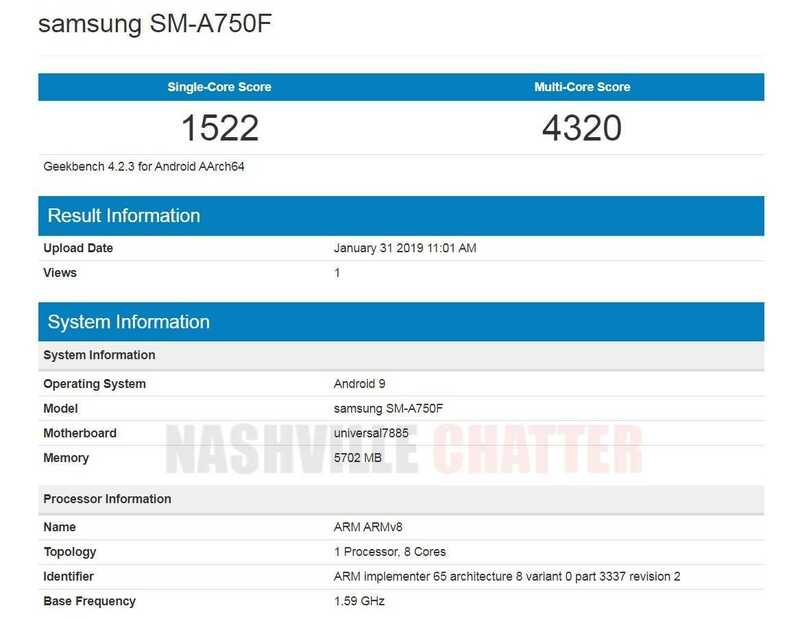 Samsung Galaxy A7 (2018) phone was listed on Geekbench with its model number SM-A750F. The scores were 1522 on single core and 4320 on multi cores. The Samsung Galaxy A7 (2018) is one of the last phones launched by Samsung, if you don’t count the mid-segment Galaxy M10 and M20 in the Indian market last week. The phone sports a 6.0 inch super AMOLED screen for display. The screen resolution reads 1080 x 2220 pixels and receives protection from Corning Gorilla Glass. The octa core Exynos 7885 processor is the CPU. The device comes in two RAM variants, 4 GB and 6 GB. The device spotted on Geekbench is the 6 GB variant. It has an internal storage of 128 GB while the 4 GB variant has 64 GB onboard storage. This is a dial SIM phone with a dedicated slot for a micro-SD card to lift the storage to 512 GB. The most talked about feature of the Samsung Galaxy A7 (2018) has been the triple camera unit in the rear, a first for Samsung smartphones. 24 MP, 8 MP and 5 MP are the shooters in this combination with the 8 MP lens being designated as the ultrawide one and the 5 MP lens, the depth sensor. The front camera for selfies is 24 MP. The fingerprint sensor has been provided on the side with the other regular sensors included onboard. A 3300 mAh battery under the hood powers this mobile. The phone was released in October last with the Android Oreo version 8.0 OS with the assurance that the OS will receive the upgrade to the Android Pie which is now happening. Samsung has positioned this device slightly above the budget segment with the price starting from around $350 for the 4 GB / 64 GB variant. This, despite the tripe camera setup. With the OS upgrade, it must offer more value for money to the users of the phone.